We are very excited to share the good work being done at Chacocente Christian School thanks to your sponsorships. We are also very excited to share with you news of the generosity of one of our donors. We have been blessed with a $25,000 matching gift! Our goal is to match it completely and we hope you will help! Pray for success! Spread the word! Hold a fundraiser! Introduce a friend to the joy of giving! All donations made now will be matched dollar for dollar up to $25,000!! Hurry as this offer ends in August! 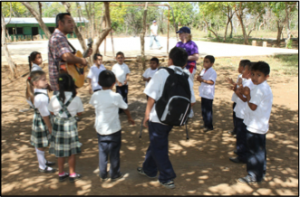 MEET LUIS: In addition to teaching the third grade class at Chacocente Christian School, Luis Alberto Gutiérrez Martínez teaches music classes. A talented guitar player, he teaches the children native folk songs, hymns, and songs in English. Practice can be in a classroom but is most often, weather permitting, outside under the trees. 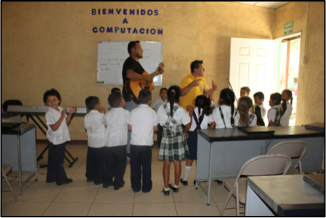 Sometimes he and José Luis, the computer teacher, collaborate using computer programs to teach the children about instruments and sounds. 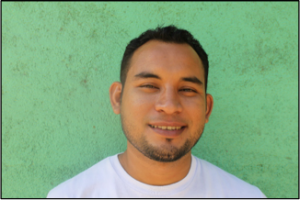 Luis has been with the school for five years and can attest to the improvement in the quality of life for the people of the project and the outlying areas. He says this has motivated him to keep improving himself and to keep studying to better himself professionally. He’s also married to the first grade teacher, Marbell, and has a one-and-a-half-year-old son. 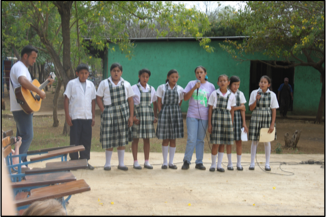 Students and teacher, Karen Elena Gómez Hernández, sing for the delegation from Rochester, New York, in February. 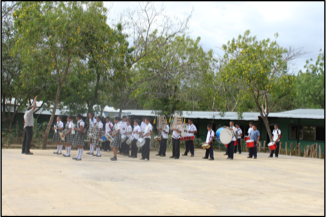 The children also make music with the Chacocente Christian School Band featuring drums, glockenspiels, and native percussion instruments. Urgent! 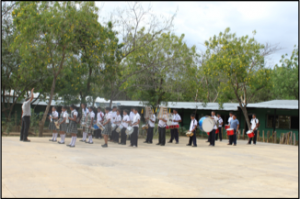 Additional sponsors are still needed to provide the necessary funds to run the school for the 2014 school year. If you know someone who might be interested in sponsoring a child for $360 a year, have him or her contact us at helpchildoutofthedump@hotmail.com. If you are using your donation as a tax deduction, please donate through your church (send to the Massachusetts address) or “Valencia UMC” with “Project Chacocente” in the memo line and mail to Valencia UMC, Attention Project Chacocente Coordinator, 25718 McBean Parkway, Valencia, CA, 91355. Otherwise donations may be sent to Project Chacocente, USA, P.O. Box 128, Lexington, Massachusetts, 02420. If you are making payments through PayPal, be sure to add the child’s name in the “special instructions for the recipient” box. Please note that PayPal charges a fee for using their service. If you are able, please add 2½% to your donation to cover this fee.